If you want to play Guild Wars, come join us. We have 5 slots available. We have 5 slots available. You said you have no minimums and when I requested to join I was denied. Please submit your request again. We will accept you. I never received your request. @ Killea,Please submit your request again. We will accept you. I never received your request. When submitting your request look for our slogan. There are several NightMares guilds. Our Guild is NightMares (capital M) and slogan is Play to slay. Slay to live yet one more day. Please submit your request again. We will accept you. I never received your request. When submitting your request look for our slogan. There are several NightMares guilds. Our Guild is NightMares (capital M) and the slogan is Play to slay. Slay to live yet one more day. We currently have 6 slots available. current challenge score . I'll join. 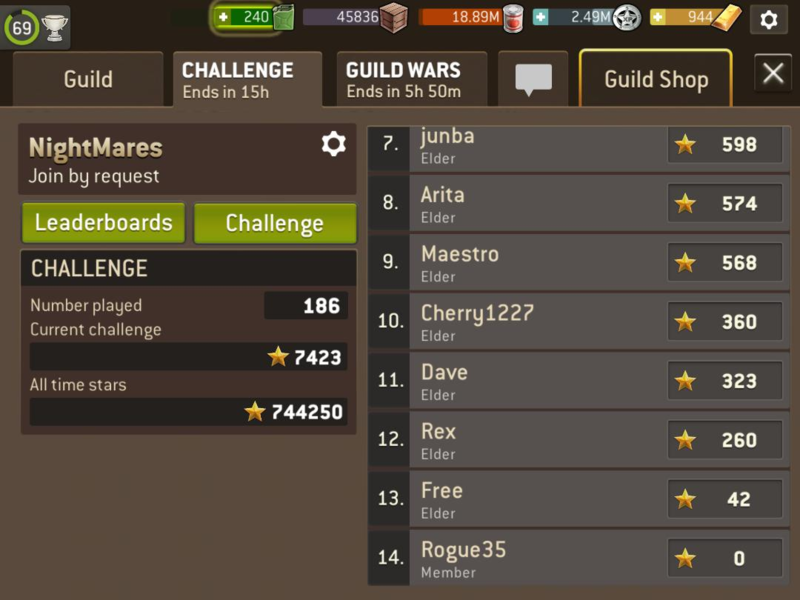 I'm looking for a decent guild. @JBreeze38 may i join as an oldie? Play to Slay. Slay to live yet one more day. Daily players. On and killing walkers as often as we can. Nice to be back @Tessy276 .